Burning is the right way to paint it. You feel yourself getting so hot, day after day. Hotter and hotter. It gets to be too much. Even for stars. At some point they fizzle out or explode. Cease to be. But if you’re looking up at the sky, you don’t see it that way. You think those stars are still there. Some aren’t. Some are already gone. Long gone. I guess, now, so am I. This is a difficult book for me to rate, because it’s impossible not to compare it to the musical rather than rating it solely on its own merit. The soundtrack of Dear Evan Hansen evokes emotion in a way I don’t think the novelization ever could. Overall, I do think the story itself works better as a musical, primarily due to who Evan is as a character. If you’re familiar with the story, you already know that Evan engages in some… morally questionable behavior. Over the course of a couple of hours in a musical, it’s easy to see how Evan could get swept up in a misunderstanding and the sense of belonging he finds. Yes, it’s wrong, but it feels like he’s been swept up in a tide and sees no way out of it. Putting the story into the format of a novel really draws attention to just how long Evan allowed this ruse to go on, and has the consequence of alienating the reader from him. That being said, I did like how the novelization didn’t strictly stick to what happens in the musical and leave it at that; Emmich puts his own spin on the story by giving Connor a bigger role, as he watches Evan and his family from beyond the grave. Emmich seeks to develop and understand Connor in a way that the stage musical never really does. While his angry outbursts aren’t excused, the story takes the time to humanize him and actually bothers to ask and answer the question of why he’s so angry in the first place. The pacing in the story was good and I loved how Emmich took the time to develop characters who felt somewhat like an afterthought in the source material, but overall, I’d say the writing was just average. 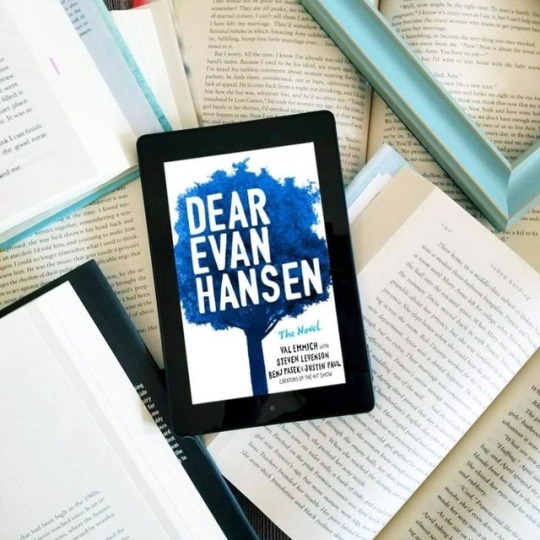 Dear Evan Hansen may be worth reading if you can’t make it to see the play, but fans of the source material may end up feeling like it falls short in comparison. Thank you for reading! Are you a fan of any novelizations of plays or movies? Let’s discuss in the comments! Next Post Blind Date With a Book? I had no idea there was a novel! I’ve listened to the musical several times online, I’m waiting for my local theater to do it. I love the soundtrack! The musical is coming to my city early next year and I’m so excited! 100%, I will cry in public. I wish they’d release professional recordings of Broadway shows on DVD. So many people don’t get the opportunity to see the shows and resort to watching illegal recordings online when they’d gladly pay for an official recording. It just feels like there’s some elitism going on there. I totally agree! There are so many Broadway shows I’d absolutely love to see, and I’ve always wished there was a way to get them on DVD or something!